When it comes to the recent rise in the number of self-cleaning litter boxes available on the market, most of them have proven to be unable to handle larger cats. If you do have a large adult cat, then finding the right self-cleaning litter tray can be a very difficult task. In most cases, you will have to visit a store and look at a display model in order to see if it is right for you. That’s certainly not the case when it comes to the LitterMaid Classic Self-Cleaning Litter Box, which is designed for larger cats or homes that have multiple cats or kittens. 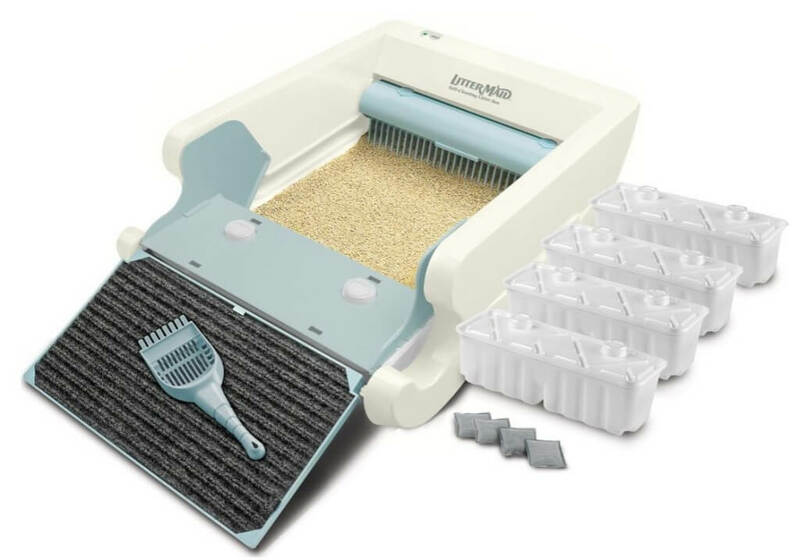 Here we will take a look at why this litter tray is perfect for larger adult cats, and help address some of the questions you want answered before you consider purchasing this litter tray. The Paw Cleaning Ramp: Quite a few of the self-cleaning litter trays that are available on the market right now have ramps to provide easy access to the tray. The ramp that comes with this tray however has a handy extra feature. The ramp is fitted with a cleaning material so then your cat’s paws are cleaned as they walk to and from the tray. This means you no longer need to worry about your cat walking through their own waste and then leaving a mess all over your floor. The cleaning ramp will help keep their paws clean at all times. Cost Effective Raking System: The problem with many self-cleaning litter trays is that the rakes that are used to clear away the cat’s used litter ends up taking a lot of clean litter along with it. This can lead to a lot of expense at times. The LitterMaid Classic Self-Cleaning Litter Box however has a well designed rake that is able to differentiate from loose clean litter and used clumped litter. This means that you will be able to save money in the long run on cat litter. Helpful Backup Battery: When you have something that is running on a battery, there is always a chance that the battery will die at the worst possible time. In this case, it could happen when your cat has just used the litter tray while you are not home, but the battery is gone so none of the waste is cleared away. This self-cleaning litter box however comes with a backup battery compartment, so then the second battery can start working whenever the first one runs out. This is a great way to take the worry of battery life out of your hands. 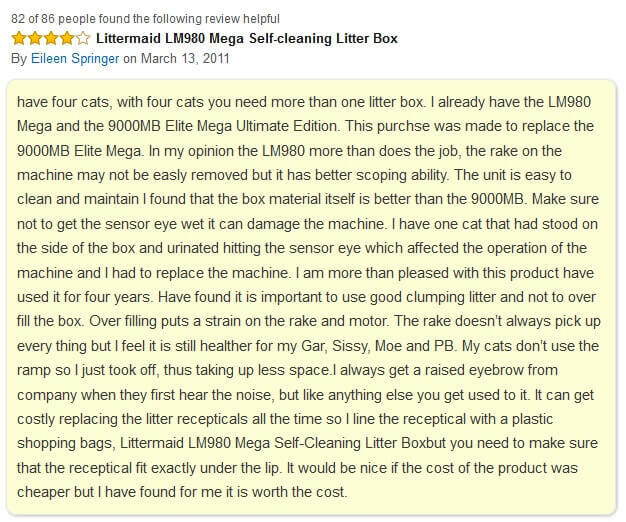 Loud, Straining Motor: Many of the customers who have bought the LitterMaid Classic Self-Cleaning Litter Box have complained that the motor on the litter tray can be very loud and irritating. It can also straining itself in order to clear away waste, which means that it could end up lasting a lot longer than expected. If you tend to keep your litter tray in an area of the house where the noise is not noticeable, then this litter box is still worth it. If however you have issues with it causing a loud noise, then this is something you will have to think about before you decide to purchase it. Rake Causing A Mess: When your cat pays a visit and the rake starts clearing the waste away, there is a chance that the waste can get smeared along the edges of the tray, or even at the back where the waste is collected. This can cause quite a bad smell if it is left unattended for a long period of time. If you plan on cleaning the tray regularly, then this will not be much of a problem for you. If on other hand you want something that you can leave for a little while before cleaning it up, then you may need to think about ways you can avoid waste getting smeared along the inside of the tray. Ineffective Odour Filters: Customers have also complained that the odour filters that are used in the self-cleaning litter tray do not work properly, and that quite a bad smell tends to rise after it has been left for a couple of days. Again, this is something that would not really bother you if you want to empty the waste collection tray daily. If however you are looking for something that you only need to empty once or twice a month or so, then it will probably be a case of trial and error to see if it will work properly. Like with most self-cleaning litter trays, you will need to buy clumping cat litter in order to make sure that the LitterMaid Classic Self-Cleaning Litter Box works properly. Clumping cat litter is usually not more expensive than regular cat litter, so there is no need to worry about extra expense. It is also quite easy to find in pet supply stores. This is really your choice. You can put plastic bags inside if you want to keep everything tidy and avoid having small pieces of waste getting stuck inside the containers. Otherwise, the waste collection containers will be able to handle the cleaning process without the bags. As long as you empty them on a weekly basis, then they should work just fine. It can be used with kittens yes, as long as they are big enough to climb inside. Kittens after all are less likely to go for the easy option of using the ramp and will instead attempt to climb over the side. As long as you make it accessible for them, they should be fine using it. The LitterMaid Classic Self-Cleaning Litter Box is certainly one of the first that really seems to take into considerations larger adult cats. The size of the tray, along with the helpful paw cleaning ramp, makes this a great purchase idea for someone who owns a large cat, or has several cats living in their household. I bought this litter box a few years ago. 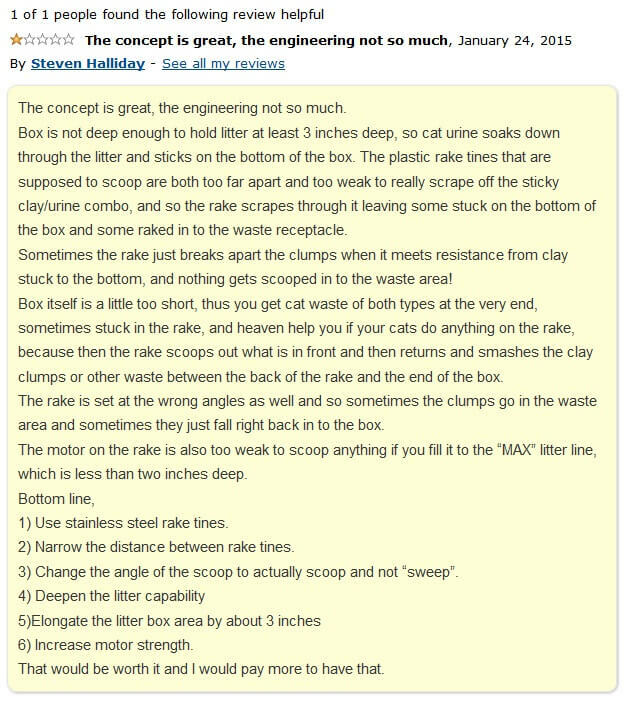 While it is more convenient than manually scooping a litter box, and does reduce the order, it has some serious flaws. First off, when you use the recommended amount of litter, it doesn’t function right. The rake pulls too much litter, so it all clumps up at the end of the box and it doesn’t fully cycle. So you have to use less litter than recommended. Secondly, the rake gets jammed way too frequently. Last, you have to maintain the littermaid. It gets dirty pretty easily, and the entire thing must be cleaned. After about a year of having it, I decided to move up to the litter robot. It was a larger investment, but two years later and I don’t regret a thing. 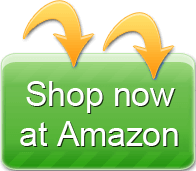 It hasn’t had any problems, it is quieter, and just an all around better product.